At least 33 people have been killed in an landmine attack on a bus carrying Indian soldiers and their relatives in Indian-administered Kashmir. About 15 others were injured in the attack, which happened in Lower Munda, about 75km from Srinagar. The bus was ripped apart by the explosion and caught fire. Kashmir's leading militant group, Hizbul Mujahideen, says it carried out the attack to avenge the killing of senior commanders in recent months. The BBC's Adam Mynott in Delhi says the attack is a tragic illustration of one of the priorities of the incoming Indian government - to try to forge peace with Pakistan over the disputed territory of Kashmir. Officials say that 15 soldiers of the Border Security Force were killed, along with 18 relatives, including six women and three children. 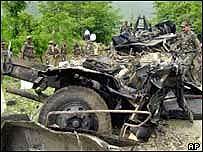 The landmine was triggered by remote control as the bus passed along the Srinagar-Jammu National Highway. It caused the vehicle's fuel tanks to ignite. The dead have been charred beyond recognition. Many of the injured are seriously hurt and the death toll could rise, says the BBC's Altaf Hussain in Srinagar. Military helicopters have been despatched to the area to evacuate the victims. The force of the blast was so large that the military bus collided with a civilian bus travelling on the road behind it, injuring three people. Police have sealed off the area, stranding hundreds of vehicles on the highway, which is the only land link between the Kashmir Valley and the rest of India. Earlier this month police in Indian-administered Kashmir said they had killed Shakeel Ahmed Bhat (also known as Shakil Ansari), Hizbul Mujahideen's divisional commander in the Jammu region, in a gun battle. In the same week they also said they had killed another commander, Abdul Rashid, also known as Gazi Shahabuddin, in a fire-fight during a raid on his hide-out in Srinagar. But Hizbul Mujahideen claimed the police had killed him while holding him in custody. In claiming the bus attack the group's spokesman made no mention of the newly elected Indian government. On Saturday India's first Sikh prime minister Manmohan Singh was sworn in. Mr Singh has vowed to find a peaceful solution to the dispute in Kashmir where a 14-year insurgency in which more than 40,000 people have been killed. "Islamist group Hizbul Mujahideen says it carried out the attack"